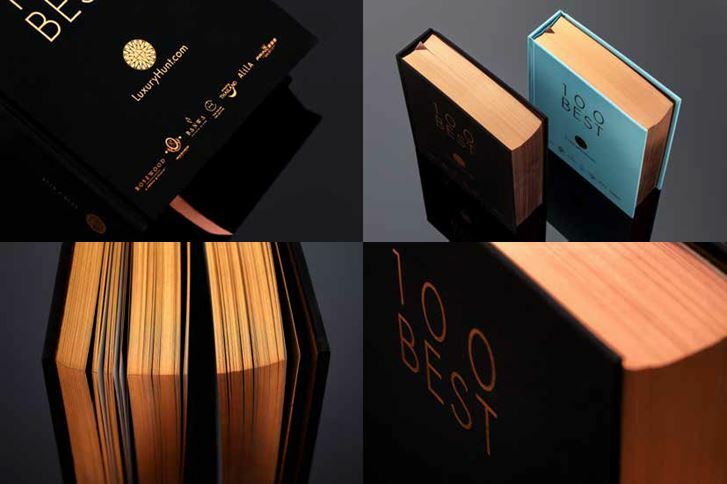 The 100 BEST, a coffee table book which features a finely curated collection of 100 of the world’s leading luxury hospitality experiences, has just released its new 2019/20 edition. This second compilation, which is actually more of a champagne bar book than a coffee table one, is curated by Sii Eawsakul, founder of LuxuryHunt.com and a travel industry expert. It explores a range of stunning top hotels from all over the world which take hospitality to the next level, including private islands, luxury tents, and even a yacht collection. 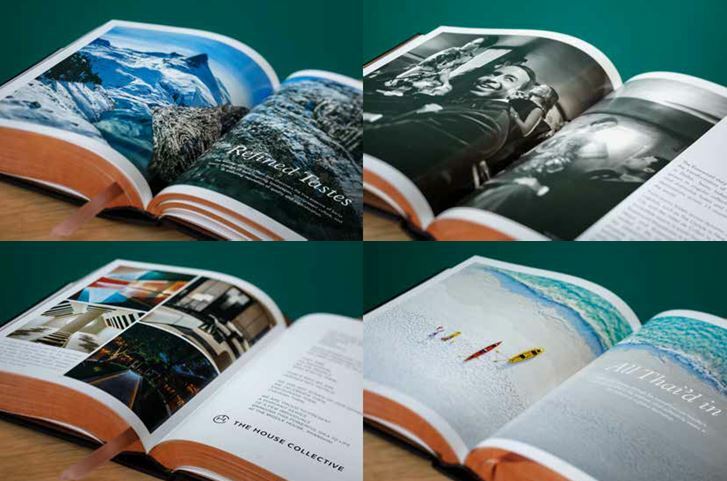 A perfect voyage book, 100 BEST is filled with first-rate photography that takes the readers to unexpected places and experiences. A special section in this latest volume also features a range of unique personalities in the travel industry such as owners, designers, general managers, and other colorful contributors. “This 2nd edition of 100 BEST comprises the best resorts, hotels, tents, and boats that not only provide you with fine bed sheets, but also full insider access to experiencing the destination’s culture and nature so you can become ever the richer with experiences,’ said Sii Eawsakul. “In this new edition, we feature approximately 80 percent new properties we have come across on our latest journeys over the past two years, and in new destinations including Tokyo, Kyoto, Shanghai, Chengdu, Shanghai, New York, Miami, Mexico, Havana and Australia. LuxuryHunt.com will soon launch a special bilingual edition focusing exclusively on China to delve into the country’s most unique projects." The launch of the new book is being celebrated with a series of high-profile events, starting at The Surin Phuket this Friday 12 April 2019. In an unprecedented collaboration between Thailand’s finest luxury hotel operators, The Surin Phuket, Rosewood Phuket, Amanpuri, The Siam, Andara Resort & Villas, The Sukhothai, Trisara and the brand new Rosewood Bangkok are pulling out all the stops to jointly stage a memorable celebration event with additional support from Louis Roederer Champagne, Iamflower and Café del Mar Phuket. The book is a must-have, not only just as a travel reference but also as a beautiful object by itself that brings you to an extraordinary world-wide journey. The Surin Phuket, Andara Resort & Villas Phuket, Rosewood Phuket, Amanpuri, The Siam, The Upper House, The Middle House, Alila Villas Uluwatu, Bulgari Resort Bali, Katamama and Potato Head Beach Club, Bali, Storchen Zurich and The Beaumont, London. Copies will also be available to enjoy through our partners Rosewood Hotels & Resorts, Banwa Private Island, The House Collective, Aman Resorts, Tourism Authority of Thailand, Alila Hotels & Resorts and Princess Yachts Southeast Asia. Issued on behalf of LuxuryHunt.com by GHCAsia. 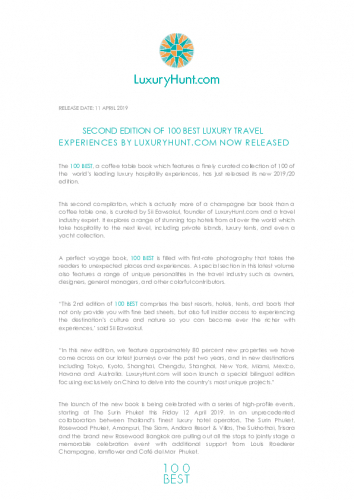 LuxuryHunt.com is an online luxury travel portal featuring a curated collection of exceptional hotels that founder Sii Eawsakul and her team of trusted guest curators have personally experienced and approved. The invitation-only collection began in May 2014 when the first Asian hotels were launched on the website and has continued to grow to now include 269 hotels in 38 countries worldwide. LuxuryHunt.com seeks to inspire luxury travelers with a curated collection of extraordinary hotels and resorts, each which possesses a unique style and personality of its own. In April 2017, LuxuryHunt published its inaugural edition of 100 BEST, an exquisitely designed hardcover book which features the top 100 hotels in the LuxuryHunt.com collection. The second and current issue of 100 BEST features the top 80 hotels in the collection and for the first time recognizes 20 extraordinary people in the hospitality industry.